ZION NATIONAL PARK – The last of seven bodies of canyoneers that fell victim to a flash flood in Zion National Park Monday night was found late Thursday morning. This brings the death toll left in the wake of Monday’s flash floods across the region to 19 overall. Park officials confirmed that the last body of a group of seven people who went canyoneering in the Keyhole Canyon portion of Zion Nation Park Monday has been located. The last body was found around 11 a.m Thursday, Eaker said. The “technical portions” of Keyhole Canyon are ones that require ropes and rappelling, he said. Of the seven bodies, four were found by search teams Tuesday, with another two located Wednesday. The group was comprised of seven people in their 40s and 50s from California and Nevada. While park officials have not yet released the names of the victims, two of the victims were identified Wednesday evening by the Ventura County Sheriff’s Office in California, those being Ventura sheriff’s Sgt. Steve Arthur and his wife, Linda Arthur. Heavy rains hit Washington County late Monday afternoon and dropped .63 inches on the park in under an hour. This resulted in the North Fork of the Virgin River rising from 55 cubic feet per second to 2,630 cubic feet per second in 15 minutes. Officials have said the park tends to received that much rain only once every three years. The group entered Keyhole Canyon Monday morning. 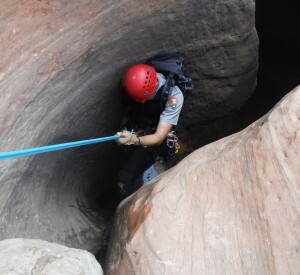 Park officials were told by another canyoneering group that cleared the canyon before the flooding began that they had encountered the seven and feared they could have been caught in the flooding. Park rangers went looking for the group and found no trace of them. A search and rescue effort began Tuesday morning. During the Search and Rescue Operations, over 60 searchers from multiple agencies have contributed over 760 hours in their efforts to find the missing canyoneers, according to a park press release. Agencies involved in the search include: Washington County Search and Rescue, Kane County Search and Rescue, Sanpete County Search and Rescue, Washington County Deputies, Town of Springdale, Rockville-Springdale Fire Protection District, Rocky Mountain Rescue Dogs, the Color Country Interagency Fire Center, Bryce Canyon National Park, Cedar Breaks National Monument, Glen Canyon National Recreation Area, Grand Canyon National Park, and Grand Canyon-Parashant National Monument. “Our condolences go out to the family and friends of the canyoneers,” Park Superintendent Jeff Bradybaugh said in the press release. This is the 19th death related to flash flooding in Washington County. 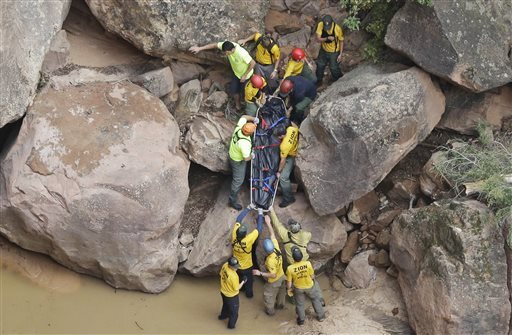 In Hildale, 12 people were killed and a 6-year-old remains missing after flood water washed away two vehicles Monday. In Mohave County, Arizona, search is ongoing for a Hurricane man whose Geo Tracker SUV was found Wednesday night badly damaged in a flood plain – the man never made it home Monday night. Which outfitter/guiding company supplied them with gear and gave them instruction on that day? This is a more relevant question to address, say, than to blame the Park Service for liability/fault in this case. The outfitter/guiding company which supplied them with gear and gave them instruction on that day was the last professional organization (experts) who had contact with them before the event. I certainly did not say that company should be sued; however, that company was paid by this group to provide them with expert training and instruction on canyoneering which should have included weather-related dangers and current weather conditions. If there’s a call for changes to the Park Service, the private companies should also review their training courses and information dissemination.